In this quick tutorial you'll learn how to draw a Northern Cardinal in 9 easy steps - great for kids and novice artists. 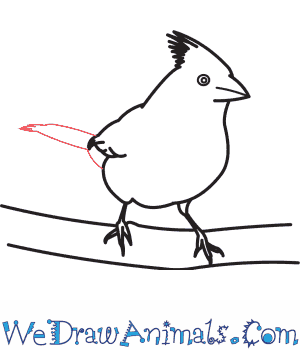 At the bottom you can read some interesting facts about the Northern Cardinal. Step 1: First, draw the head. 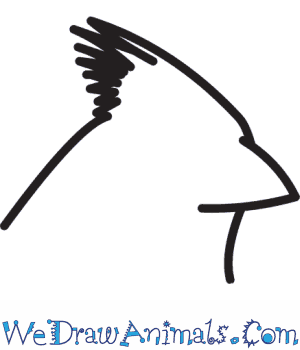 Draw the back of the head line at a left to right upward angle. At the top of this line add some jagged lines. Make them slightly bigger each time. After you've made about 10 jagged lines draw the top of the head. 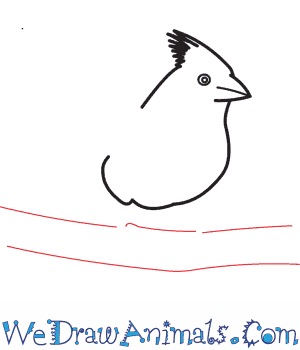 It is a flat line that moves right into the top of the beak. Complete the sideways "V" shaped beak. Draw another short line under the beak to make the neck line. 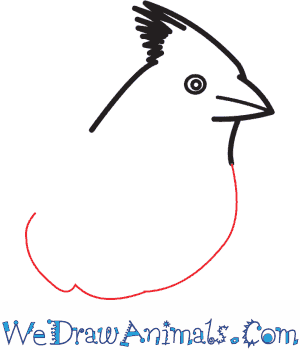 Step 2: Draw a short straight line down the middle of the beak to make the mouth line. Just to the left of the mouth line draw a small circle. Then draw a slightly larger circle around that one. Step 3: Continue the neck linedown and curve it sharply down and to the left. Bend it back up at the bottom so that it reaches toward the back line. Step 4: Under the body line draw two parallel lines to make a thick branch for the cardinal to perch on. Step 5: From the left part of the bottom body draw a short leg down to the branch. Draw three sharp toes gripping the branch. Step 6: On the right side of the body draw another short leg down to the branch. Make another three pointy toes in the middle of the branch. Step 7: Between the body line and the back line draw the wings. 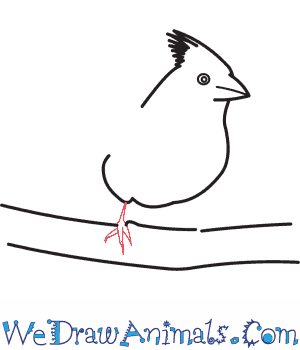 It is a slightly crooked "L" shape with a bump bottom to make the feathers. Step 8: Just to the left of the wing draw two short lines across to make a thick tail feather. It has jagged feathers at the tip just like on the back of the head. 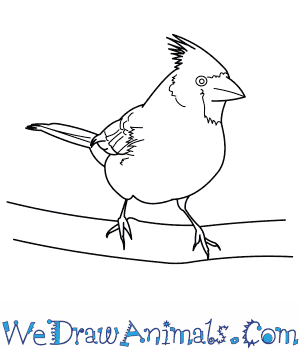 Step 9: Finally, draw squiggly lines on the face, neck and wings to create the feather patterns. The Northern Cardinal is a member of the bird group and the scientific term for them is Cardinalis cardinalis. This animal derives its name from the species relative that has a preference of upper latitudes. Another reason for the name is because it mimics the religious authoritative figures of the Roman Catholic Church since they both wear red on their body and head; exclusive features of the bird are a black face and crest on the back of their head. Other popular names for this creature are the Redbird and Common Cardinal. ? They can reach a length of over 3/4 of a foot. This bird has a wingspan of over 1 foot. Their nest takes up to 9 days to build. The age of this bird can reach up to almost 30 years. The male feeds the female during mating season. This bird can be found from Canada to Mexico on the eastern region, in woodlands, gardens, shrublands, and swamps. They sing as a method of territorial defense, to protect their ideal domain that has a source of seeds, but they also eat insects and fruit. These animals have a low population amount, but are considered to be the least concern for the possibility of extinction.